Hadhrat ‘Umar , of whom all the Muslims are justly proud, and the disbelievers still dread, was most adamant in opposing Nabi SAW and very prominent in persecuting the Muslims before he embraced Islam. One day, the Quraish in a meeting called for somebody to volunteer himself for the assassination of Nabi SAW. 'Umaroffered himself for this job,at which everybody exclaimed: "Surely, you can do it, 'Umar!" With sword hanging from his neck, he set out straight away on his evil mission. On his way he met Sa'ad bin Abi Waqqas of the Zuhrah clan. "Where are you going to, Umar? “ inquired Sa'ad . Umar replied: "I am going to finish Muhammad." Sa’adwarns Umar: "But don’t you see that Banu Hashim, Banu Zuhrah and Banu Abde Munaf are likely to kill you in retaliation?" 'Umar (gets upset with the warning): "It seems that you also have renounced the religion of your forefathers. Let me settle with you first." So saying, Umar drew out his sword. Sa'ad , announcing his Islam, also took out his sword. They were about to start a fight when Sa'ad said: "You had better first set your own house in order. Both your sister and brother-in-law have accepted Islam." Hearing this, Umar flew into a towering rage and turned his steps towards his sister's house. The door of the house was locked from inside and both husband and wife were receiving lessons in the Qur’aan from Hadhrat Khabbab . 'Umar knocked at the door and shouted for his sister to open it. Hearing the voice of 'Umar, Hadhrat Khabbabhid himself in some inner room forgetting to take the pages of the Holy Qur’aan with him. When the sister opened the door, 'Umar hit her on the head, saying: "O, enemy of yourself, have you also forsaken your religion." Her head began to bleed. Umar then went inside and inquired, "What were you doing and who was the stranger I heard from outside?" His brother-in-law replied, "We were talking to each other." 'Umar said to him, "Have you also forsaken the faith of your forefathers and gone over to the new religion?" The brother-in-law replied, "But what if the new religion be the better and the true one?" 'Umar became furious and pounced on him, pulling his beard and beating him mercilessly. When the sister intervened, he smote her face so violently, that it bled most profusely. She was, after all, 'Umar's sister, she burst out: "'Umar! We are beaten only because we have become Muslims. Listen! We are determined to die as Muslims. You are free to do whatever you like." When 'Umar had cooled down and felt a bit ashamed over his sister's bleeding, his eyes fell on the pages of the Qur’aan left behind by Hadhrat Khabbab . He said, "Alright show me, what are these?" "No," said the sister, "you are unclean and no unclean person can touch the Qur’aan." He insisted, but the sister was not prepared to allow him to touch the Qur’aan unless he washed his body. 'Umar at last gave in. He washed his body and then began to read the Qur’aan. It was Surah "Taha". 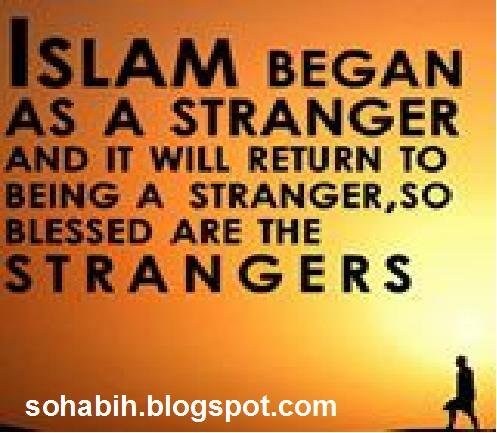 He started from the beginning of the Surah, and he was a changed man altogether when he came to the verse: "Lo! 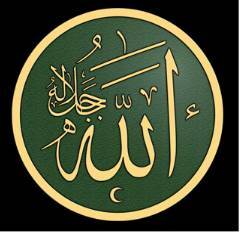 I, indeed I am Allah. There is none worthy of worship save Me. So serve me and establish Salaah for My remembrance." He said: "Alright, take me to Muhammad SAW." On hearing this, Hadhrat Khabbab came out from inside and said: "O, 'Umar! Glad tidings for you. Yesterday (on Thursday night) Nabi SAW prayed to Allah, O, Allah strengthen Islam with either 'Umar or Abu Jahl, whom so ever You like'. It seems that his prayer has been answered in your favour." 'Umar then went to Nabi SAW and embraced Islam on Friday morning. 'Umar's Islam was a terrible blow to the morale of the unbelievers, but still the Muslims were few in number and the whole country was against them. The disbelievers increased their efforts to completely wipe out the Muslims and Islam. With Umar now on their side, the Muslims started to say their Salaah in the Haram. Hadhrat Abdullah bin Mas'ood says: "'Umar's Islam was a big victory, his emigration to Madinah a tremendous reinforcement, and his appointment as Khalifa, a great blessing for the Muslims." Umar (R.A.) belonged to “‘Adi” family of Quraish tribe. In the 8th generation, his lineage joins with the Holy Prophet (Sallallahu ‘alaihi wa Sallam). Abu Hafs was his patronymic name and “al-Faruq” his title given by the Holy Prophet (Sallallahu ‘alaihi wa Sallam). He was born in 583 A.C., about forty years before the great Hijrah. The early life of Hadrat Umar is not known in detail. In his youth he was a famous wrestler and orator, and a spirited person. He was one among the few people in Mecca who knew reading and writing before Islam. His main occupation was business. When the Holy Prophet (Sallallahu ‘alaihi wa Sallam) got revelation and invited people to Islam, Umar became the sworn enemy of Islam and the Holy Prophet (Sallallahu ‘alaihi wa Sallam) and did not hesitate to harm the Muslims and Islam at every opportunity. Umar exclaimed, “Surely this is the Word of Allah. 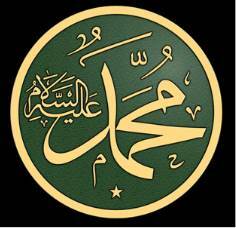 Take me to Muhammad (Sallallahu ‘alaihi wa Sallam)”. On hearing this Hadrat Khabbab (R.A.), who had hidden himself in the house, came out from inside and said, “0 “Umar! Glad tidings for you. It seems that the prayer of the Holy Prophet (Sallallahu ‘alaihi wa Sallam) which he said last night has been answered in your favour. He had prayer to Allah: “O Allah, strengthen Islam with either Umar b. Khattab or Umar b. Hisham whomsoever Thou pleaseth”. Umar then went to the Holy Prophet (Sallallahu ‘alaihi wa Sallam). On seeing him, the Holy Prophet (Sallallahu ‘alaihi wa Sallam) asked him, “Umar! what brings you here”? He said, “I am here to accept Islam”. Hearing this the Muslims shouted with joy, “Allahu Akbar”(Allah is the Greatest) and the sound rent the air of Mecca. As a matter of fact, Umar’s conversion to Islam was a terrible blow to the morale of the disbelieves. ‘Abdullah bin Mas’ud, a great Companion, says, “Umar’s conversion to Islam was a great triumph, his emigration to Medina a tremendous reinforcement and his accession to Caliphate a great blessing for the Muslims”. In some history books there are more details in this connection. I have followed the version of Shaikh Muhammad Zakariya (Damat Barakatuhu) given in his book ” Hikayat-i-Sahabah”. Conversion of Hadrat Umar (R.A.) strengthened Islam. Hitherto, Muslims had lived in constant fear of disbelievers, and most of them were concealing their faith. The Muslims were now able to offer their Salat publicly. When Hadrat Umar (R.A.) became a Muslim he declared his faith openly before the Quraish Chiefs. Though they stared at him but could not do any harm to him. Then he requested the Holy Prophet (Sallallahu ‘alaihi wa Sallam) to offer Salat in the Ka’bah. On getting the consent of the Holy Prophet (Sallallahu ‘alaihi wa Sallam), Hadrat Umar led a party of the Muslims to that place. Hadrat Hamzah, who had accepted Islam a few days before Umar (R.A.) carried another party of the Muslims to Ka’bah. When all the Muslims gathered in the Ka’bah they offered their Salat in congregation. The Holy Prophet (Sallallahu ‘alaihi wa Sallam) led this first public Salat in the history of Islam. For this courageous and bold action of Hadrat Umar (R.A) the Holy Prophet (Sallallahu ‘alaihi wa Sallam) gave him the title of “al-Faruq” i.e., the one who makes a distinction between the “Right” (Haqq) and the “Wrong” (Batil). When the Muslims were ordered to migrate to Medina, most of them left Mecca quietly and secretly, but Hadrat Umar (R.A.) declared it openly. He put on his arms and first went to the Ka’bah. After performing the Salat he announced loudly: “I am migrating to Medina. If anyone wants to check me, let him come out. I am sure that his mother would cry for his life”. There was no man in Mecca to accept the challenge of Hadrat Umar (R.A.). Then he migrated to Medina boldly. Hadrat Umar (R.A.) had great love for Allah and the Holy Prophet (Sallallahu ‘alaihi wa Sallam). He participated in almost all the big battles: Badr, Uhad, Ahzab, Khaibar, Hunain etc. In the expedition to “Tabuk” he gave half of his wealth in the path of Allah. He was next to Hadrat Abu Bakr (R.A.) to sacrifice his belongings for the cause of Allah. The Holy Prophet (Sallallahu ‘alaihi wa Sallam) also had a deep love for him. Once he remarked, “were a prophet to come after me, he would have been Umar”. In another Hadith mentioned in Bukhari, Hadrat Abu Hurairah (R.A.) narrated that the Holy Prophet (Sallallahu’alaihi wa Sallam) said, “In Bani Isra’il (Israelites) there were people who were not prophets but talked to Allah. 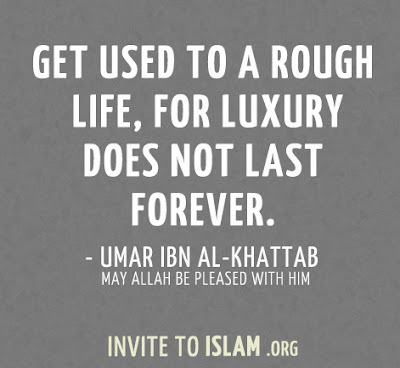 Were anyone in my Ummah (people) like those persons, he would be Umar”. The death of the Holy Prophet (Sallallahu ‘alaihi wa Sallam) was a great shock to him, and he could not believe it until Hadrat Abu Bakr (R.A.) reminded him of a clear verse of the Holy Qur’an on the subject. He then went to the Council Hall along with Hadrat Abu Bakr (R.A.) where the people of Medina had assembled to select the First Caliph. Hadrat Umar (R.A.) was the first person to pledge loyalty(Bai’at) at the hand of Hadrat Abu Bakr(R.A.), and then helped him throughout the duration of his rule. As described in connection with the life of Hadrat Abu-Bakr, during his illness he consulted the “Shura” about the next “Khalifah” and then gave his decision in favour of Hadrat Umar (R.A.) who took the charge of Caliphate after the death of Hadrat Abu Bakr (R.A.) on 22nd of Jamadi-uth-Thani 13 A.H. (23rd Aug. 634 A.C.).Umar (R.A.) followed fully the ways of the Holy Prophet (Sallallahu ‘alaihi wa Sallam) and the policy of his predecessor with his characteristic zeal and vigour. It was his strict adherence to the “Sunnah” of the Holy Prophet (Sallallahu ‘alaihi wa Sallam) which helped him to subdue the mighty empires of Persia and Byzantine. His caliphate marked the “Golden Age” of Islam. I would like to discuss only main events which took place during the Caliphate of Hadrat Umar (R.A.) in brief. During the time of Hadrat Abu Bakr (R.A.), Hadrat Khalid bin Walid conquered part of Persian Empire, known as the Kingdom of Hira. Then he was ordered by Hadrat Abu Bakr (R.A.) to join the expedition to Syria. At the time of his departure, he appointed Muthanna bin Harith as the commander of the Islamic army. The Persians became furious at the loss of the kingdom of Hira and the Emperor sent a large army under the command of a very famous General, Rustam the Commander-in-Chief of Persian armies. In view of the growing pressure of Persians, Muthanna requested Hadrat Umar (R.A.) for reinforcement. At that time there was a large gathering of Muslims in Medina to take pledge of loyalty (Bai’at) at the hand of the new Caliph (Hadrat Umar). He put the matter before the Muslims but did not get any response in the beginning. Then Hadrat Umar (R.A.) in his sermons stressed the importance of Jihad and a large number of Muslims volunteered to help Muthanna against the Persians. Abu’Ubaid ath-Thaqafi was appointed as the commander of the Islamic army comprising five thousand men. In the meantime Persians attacked the places conquered by Muslims and they lost some of them. In the early stage of the battles Rustam sent his subordinates to face Muslims. When Abu’Ubaid had reached there a battle took place at “Namariq” and the Muslims won it. A number of famous generals of Persians army including Jaban, right hand of Rustam, were killed in the battle. Then some small battles also took place at Kaskar etc. The defeat of Persians startled Rustam and he gathered a huge army to face the Muslims. The army met the Muslims on the other bank of the Euphrates under the command of Bahman, a famous Persian warrior. Bahman asked Hadrat Abu Ubaid whether Persians should cross the river or the Muslims. Hadrat Abu’Ubaid was over-confident and chose to cross the river, although some of the Muslim generals like Muthanna did not like to cross the river, and preferred to let the Persians come. The Islamic army crossed the river but lost the battle. Hadrat Abu ‘Ubaid was also martyred and Muslims fell one after the other. Muthanna took over the command and ordered rebuilding of the bridge which had been destroyed. The elephants of the Persian army caused considerable damage to the Muslim army. However Muthanna could save only 3000 men out of an army of 9000. The Empire of Islam during the reign of Sayidina Umar Al Khattab RA. Hadrat Umar (R.A.) was shocked at the defeat of the Muslim army. He sent special messengers to various tribes and exhorted the Muslims to prepare for the Holy War against Persians. A new reinforcement was sent to Muthanna’s army. In this army a number of Christian Arabs were also included. The Persians also gathered a huge army. This time Rustam, the Commander-in-Chief of the Persian armies, appointed Mehran Hamdani as the Commander because he had travelled Arabia and knew the Arabian way of fighting. The Muslim army, under the command of Muthanna, met the Persians at a place called Buwaib (where “Kufa” is situated). The Muslims invited the Persians to cross the river and they accepted it. The number of Muslim army was a little more than 20,000 while the Persians (Iranians) several times larger in number, were estimated as two hundred thousands. A fierce battle took place. Muslims fought desperately and after a grim fight, the Persians were defeated. They could not find the way to cross the river Euphrates because the bridge built by them was destroyed by the Muslims. There was a total disorder in the Persian army. The commander of the army, Mehran was slain in this battle and not less than a hundred thousand men lost their lives in the field. As a result of this victory the whole of western part of Persians Empire (now Iraq) fell into Muslim hands. The great defeat at Buwaib shocked the Persian Empire. It was not only a cause of great disturbance to the rulers but to the public as well. For the first time they realised the strength of Muslims. The news of loss of one hundred thousand Persians and only few hundred Muslims was received with great surprise. At that time a woman, Puran Dukht was the Empress. The Iranians (Persians) replaced the Empress by a young 21 year old Emperor, Yezdgird. The new Emperor reorganised the army and strengthened the frontier defences. There arose a number of rebellions in the places conquered by Muslims as a result of which Muslims again lost some of the parts which they had conquered. This advice clearly shows that the aim of Muslims was to proclaim Allah’s message — ISLAM, rather than to fight. The sword was used to clear the barriers in the way. In the meantime Muthanna died and his brother Bashir joined Hadrat Sa’d (R.A.) with an army of eight thousand. Hadrat Sa’d was in direct contact with Hadrat Umar all the time who was constantly giving instructions about the movement of the army from place to place. Finally Hadrat Umar (R.A.) sent instructions to it to encamp at Qadisiya and to send an envoy to the Persian Emperor, Yezdgird, with the Message of Islam and peace. Following the instructions of the Caliph, Hadrat Sa’d encamped at Qadisiya. The Muslims had to wait there for about two months for the Persian armies. In the meantime Hadrat Sa’d sent an envoy to the Emperor Yezdgird. Yezdgird who was very proud of his power and army, lost his temper on hearing this and insulted the envoys. He got a basket full of earth and put it on the head of the leader, Hadrat ‘Asim (R.A.). When Hadrat ‘Asim carried the earth to Hadrat Sa’d (R.A.), he took it as a sign for victory. The ill-treatment of the Persian Emperor hastened the war. The Emperor sent an army of one hundred thousand men. This time Rustam, the Commander-in-Chief, was himself leading the Persian army. Other famous commanders of the army were Jalinus, Mahran bin Bahram Razi and Harmuzan. Rustam was afraid of Muslims and hesitated to face them. He took six months to reach Qadisiya from Mada’in, the capital. He wanted to negotiate with the Muslims in the first instance. Therefore he asked them to send a delegation. The Muslim delegation went to Rustam’s camp at the head of Hadrat Rabi’ bin ‘Amir (R.A.) There took place much discussion but no decision was reached. Hadrat Rabi’ (R.A.) gave the message of Islam boldly and put the same three conditions which were put before the Emperor by Hadrat Nu’man. On the second day Rustam again asked Hadrat Sa’d (R.A.) to send the delegation. This time he sent Hadrat Hudhaifah (R.A.) who also put the same three conditions and told him if he did not accept them within three days, the third alternative i.e., the use of sword would remain and would be acted upon. Third day Rustam again requested Muslims to send an emissary and this time Hadrat Mughirah bin Shu’bah (R.A.) went. Rustam tried to negotiate in terms of money by saying: “I think you are poor and hungry. We would give you so much of wealth that would be sufficient for the whole of your life.” Hearing this Hadrat Mughirah (R.A.) angrily replied, “Of course we were hungry and poor but Allah sent His Messenger to us because of whom our fate changed and Allah nourished us. He asked us to obey only One God and to spread His message. If you follow His message (Islam) you are our brothers, we will never fight with you. If you don’t, then let us spread His Kalimah and you pay to us “Jizya” (Defence Tax) otherwise the sword will give the final decision.” Hearing this Rustam got furious and vowed to kill all the Muslims as soon as the sun rose the next day. Hadrat Mughirah (R.A.) returned to the Muslim camp saying: “La haula wala quw-wata illa billahil’Azim” (There is neither any power nor any might besides Allah, the High). At last the battle started at Qadisiya in the month of Muharram, 14 A.H. (June, 637). Hadrat Sa’d was sick and directed the operations from the sick bed. This battle was hotly contested and lasted for three days. Muslims were about 28,000 in number while the Persian army was estimated at 120,000 (four times bigger than Islamic army). Rustam displayed great skill in arraying his troops. On the first day the battle started amidst loud cries of “Allahu Akbar” (Allah is the Greatest). Though the Muslims displayed great valour and skill but the Persian elephants played havoc with the Muslim cavalry. The Arab horses were not trained to fight in a battle having elephants. However Muslim archers and lancers rained arrows and spheres and knocked down many elephant riders. The battle ended without reaching a final decision on the first day. The following day the battle again ended without a victory for any of the two armies. On the third day Muslims wrapped pieces of cloth round the bodies of their camels to frighten the Persian elephants. The plan worked out successfully. Moreover a number of Muslim archers pierced the eyes of the elephants and cut their trunks. The blind elephants ran towards the Persian army and destroyed their ranks. The battle continued to the fourth day. Now the blind elephants played a havoc with the Persians themselves. Then some of the Muslim warriors from among the chief of the clans rushed towards Rustam and destroyed the special battalion around him. The canopy of Rustam was blown in the air and he himself tried to flee. He was detected by the Muslims and was slain. Seeing their slain Commander, the Persians started fleeing for their lives. Thousands of Persians were slain. There were about six thousand Muslim casualties while the number of the Persians killed was thirty thousand. The battle of Qadisiya proved to be decisive in the history of Islam. It shattered the strength of the Persian Empire. Hadrat Umar (R.A.) received the news with great joy. The Muslims gained immense booty which was distributed among the troops according to the Islamic law and a fifth portion was despatched to the Baitul Mal. 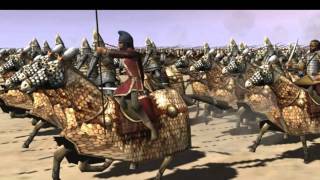 Following the victory at Qadisiya, Muslims chased the Persians. They captured Babal and Kutha and then laid siege to Bahrah Sher, a very important and strong fort at the outskirts of the Persian capital, Mada’in (Ctesiphon). The siege went on for two months and ultimately Muslims captured the fort. The next step was to conquer Mada’in, the capital itself. The City of Mada’in was situated on the east bank of river Tigris and was almost surrounded by it. After a rest of few months, Hadrat Sa’d took permission from Hadrat Umar (R.A.) to invade the Capital. When Hadrat Sa’d (R.A.) marched, the Persians destroyed the bridge on the river. The river was deep and turbulent but the determination of Muslims was not affected. They were having full faith in Allah, Almighty, the Creator of the Universe. It has been recorded in some books of history that on finding the destruction of the bridge by the Persians Hadrat Sa’d said: “Allah made a way in the Red Sea for Moses and his followers, He will surely help us who are following His Last Prophet, Hadrat Muhammad (Sallallahu ‘alaihi wa Sallam).” He consulted the generals of his army and then ordered the Muslims to go across. First of all sixty horsemen plunged themselves in the river and crossed it. Then the whole army crossed the river as if it was walking on the ground. Seeing the Muslims crossing the river the Persian archers rained arrows on the Muslims. Hadrat Sa’d had already appointed six hundred archers on a nearby hill. They assaulted the Persians who ran away saying: “Dev amdand, Dev amdand”(i.e., “The giants have come! The giants have come!”). The Muslims crossed the Tigris without any severe loss. Yezdgird and his ministers had already fled and the capital was captured without any opposition. With this victory the whole of the territory between the Euphrates and the Tigris came under the possession of the Muslims. The prophecy of the Holy Prophet (Sallallahu ‘alaihi wa Sallam) came true: “A group of Muslims will capture the White Palace of the Persian Emperor”. Both Hadrat Umar and Hadrat Sa’d (Radiallahu anhuma) thanked Allah for this great victory. When the rich booty from the White Palace of Yezdgird reached Medina, tears came out in the eyes of Hadrat Umar (R.A.) and he remarked, “I am weeping because riches are often the cause of enmity and mutual bitterness. Those people who have such evils, ultimately lose respect”. The Persian Emperor took shelter in Hulwan and started preparation for a big assault on the Muslims. Now Kharzad, brother of Rustam was the Commander-in Chief. He gathered a huge army to avenge the past defeats. After consultations with Hadrat Umar (R.A.) Hadrat Sa’d bin Abi Waqqas (R.A.) sent an army under the command of Hashim and Qa’qas to face the Persian army at Jalula. Again a fierce battle was fought and ultimately the Persians were defeated who fled further north. The Muslims advanced ahead and captured Qaka and finally Hulwan where Yezdgird, the Emperor was staying. He fled to Khurasan and settled down in Mery. The last big battle was fought in the month of Muharram, 19 A.H. (642 A.C.) at Nihawand in which the Persians were completely defeated. Then a number of small battles took place and the Muslims conquered Hamdan, Azerbaijan and Armenia by the year 21 A.H. The Persian Emperor fled to Isphan, then to Kirman and from there to Balkh. The Muslims chased him everywhere. Ultimately the whole of Persia came under the sway of Islam, by the year 23 A.H. The Muslims marched as east as Sind (the Indian territory, now Pakistan). They captured Makran and Baluch. But Hadrat Umar (R.A.) stopped them who were under the command of Hakam at that time. He did not want to extend his frontiers at the price of Muslim blood. Thus Makran was the last place in the east under the rule of Muslims during the caliphate of Hadrat Umar (R.A.). After the capture of Persian Empire, Hadrat Umar (R.A.) remarked: “Allah has destroyed the Persian Empire, now they cannot harm the Muslims. 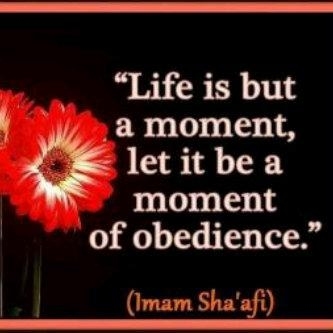 O Muslims, if you do not follow the Straight Path, Allah would take this power from you and hand it over to whom He likes”. The conquest of the Persian Empire provided the Muslims with unlimited resources. At the same time it also brought Muslims into touch with luxuries and as time passed they gave up their simple living and fell prey to some vices prevailing in those days Hadrat Umar had feared. Muslims established two military cantonments one at Basra and the other at Kufa in 638 A.C. Later on these cantonments became big cities. Basra was established at the Shatt-ul-Arab and was important because it guarded the passage from the Persian Gulf to Mesopotamia. Kufa was founded at the bank of the Euphrates. Afterwards these cities became important centres of Islamic culture and civilisation. The causes of the war between the Muslims and the Byzantines (commonly called as Romans) have already been discussed. During the time of Hadrat Abu Bakr (R.A.) the Muslims had defeated Romans on the Syrian front and captured a number of cities like Busra and Ajnadain. They laid siege to Damascus when Hadrat Abu Bakr (R.A.) passed away. After his death they captured Damascus, Hims and Qansrin. In all the three battles Hadrat Khalid bin Walid played an important role. Hadrat Umar (R.A.) recognised Khalid’s merits and said, “May Allah bless the soul of Abu Bakr, he put Khalid in the right place”. The fall of these important cities made the Byzantine Emperor, Heraclius, furious and he sent a huge army to fight with the Muslims. In order to face this big army, Muslims left some of the places, occupied by them and returned to safer border. When the Islamic armies were leaving the conquered places they paid back the “Jizya” (the Defence Tax) received from the non-Muslim inhabitants of those places saying: “Since we cannot protect you, we are returning it.” This was a unique example in history. The people of those places were greatly impressed by the Muslims’ treatment. It is given in some books that the people of those places cried when Muslims left their places. After the fall of Damascus, Hims and other places, the Romans fled to Antioch where Heraclius was staying and was thinking of moving to Constantinople, his permanent capital. They appealed to Heraclius to help them against the Muslim armies. He held this court at Antioch and to beg an raising a huge army against the Muslims to wipe them out of Syria. The Muslims had already gathered at Yarmuk to face the Roman Byzantine army. The Romans were several times larger in number than the Muslims. In the beginning the commond was in the hand of Hadrat Khalid bin Walid (R.A.) but during the battle he received the letter of Hadrat Umar deposing him from the post of Commander-in-Chief. Hadrat Umar (R.A.) appointed Abu ‘Ubaidah bin Jarrah (R.A.) as the Commander-in-Chief. A fierce battle was fought on the 20th Aug., 636, and at the end the Romans lost the field. The cavalry fled and the infantry was put to sword. Theodorus, the Commander of Roman army himself fell and his entire army was turned into a fleeing, panic-stricken mob. According to Tabari, about one hundred thousand Romans were killed in this battle. Muslim causalities were three thousand. (Note: According to some historians it was the 2nd battle of Ajnadan and not the battle of Yarmuk which took place in 15 A.H.). According to those historians who hold the opinion that the Battle of Yarmuk took place before the fall of Damascus, Hadrat Khalid was deposed in the early part of Umar’s (R.A.) caliphate, while some think it took place around 17 A.H. because according to them the battle of Yarmuk took place after the fall of Damascus. Hadrat Amr bin al-‘As was in the beginning leading the army in front of Jerusalem. After the capture of Antioch and other key cities of Byzantium, Hadrat Abu’Ubaidah also joined him along with Hadrat Khalid bin Walid (R.A.) They laid siege to the great city of Jerusalem, surrounded by a huge wall. Since the people of Jerusalem had already seen the defeat of Byzantine forces they offered a peaceful truce provided the “Khalifah” came in person to sign the treaty in their presence. The proposal was passed over to Hadrat Umar (R.A.) at Medina and after consultation with the “Shura” he accepted the offer. Then Hadrat Umar (R.A.) signed the treaty under which the inhabitants of Jerusalem were granted complete security of their life and property. Their places of worship were secured and remained intact. All the people were allowed to follow their religion freely. The gates of the city were then opened and the Muslims entered the Jerusalem in the year 16 A.H. (i.e., 635 A.C.) According to some history books the date given on the treaty signed by Hadrat Umar (R.A.) falls in the 17th year A. H. It is possible therefore that the Muslims conquered it early in 17th year A.H.
Hadrat Umar (R.A.) visited the city. The time of the “Salat” had reached. The Christians allowed the Muslims to perform Salat in the big Church but Hadrat Umar declined to do so that it might not be an excuse for the future generations to take over the Church from them. He offered the Salat with the Muslims on the steps of the Church. Even then he gave in writing to the Bishop that the steps would never be used for congregational prayers or for the Adhan in future. After the conquest of Jerusalem the Romans (Byzantines) tried to regain Syria. The Muslims did not want territorial expansion, they were fighting either to protect the birth-place of Islam, Arabia or in self-defence. Their aim was only to proclaim Allah’s message and to preach Islam freely. Whenever they were allowed a free passage to show the right path no fighting took place as it could be noticed in the case of Jerusalem. Never, in the history of Islam any nation was forced to forsake its religion and to accept Islam. The people of Jazirah (now North western part of Iraq) plotted to oust the Muslims from Syria. Heraclius, the Emperor of Byzantine sent his army to help the people of “Jazirah”. They invaded Hims, a fort which had been conquered by the Muslims under the command of Hadrat Abu ‘Ubaidah (R.A.). The Muslims fell upon the enemies and beat them off. Under such conditions Hadrat Umar (R.A.) ordered the Muslim forces to occupy Jazirah. After its conquest Jazirah (Mesopotamia) was put under the Governor of Homs (Home). Jazirah was conquered under the command of ‘Ayad bin Ghanam (R.A.). When the famine became intolerable he prayed to Allah in a big gathering of Muslims. It has been narrated that the prayers had not even finished when rains started to pour down. About the same time plague spread in most parts of Iraq, Syria and Egypt and it caused great havoc not only to civilians but also to the Muslim armies. After the plague Hadrat Umar went to Syria to inspect the losses caused by the plague. Three important figures Abu ‘Ubaidah, Mu’adh bin Jabal and Yazid bin Abu Sufyan (R.A.) had passed away. He appointed Mu’awiyah bin Abi Sufyan as the Governor of Damascus in place of his brother Yazid bin Abi Sufyan. Being a powerful province of Byzantine Empire and having the strong base of Byzantine navy at Alexandria, Egypt was a great danger to the security of Hijaz (Northern Arabia). The Romans were busy in plotting against the Muslims to regain the territories conquered by the Muslims and to attack them through Egypt. Obviously it was necessary from the point of view of defence to drive back the Romans (Byzantines) from Egypt. Therefore, towards the close of 17 A.H. (638 A.C.) Hadrat ‘Amr bin al-‘As (R.A.) who had collaborated in the conquest of Palestine, repeatedly urged the Caliph to authorise him to lead a campaign against the valley of the Nile. He got the necessary permission from the Caliph and set out from Palestine for Egypt at the head of four thousand men. (Note: According to a number of historians it took place in the 18th year A.H. i.e., 639 A.D. All of them agree that a part of Egypt had been conquered before the great famine which happened in 17-18 A.H. If it is true, the date of invasion by ‘ Amr bin al-‘As must be before 18 A.H.). Hadrat ‘Amr bin al-‘As entered Egypt by the route of Wadi al-Arish and after attacking some small towns laid siege to one of the strongest forts of Romans in Egypt at Fustat (which later became Cairo). The fort was conquered after some time. “I am afraid that the Muslims have not been acting fully upon the teachings of the Holy Qur’an and the Sunnah (ways) of the Holy Prophet (Sallallahu ‘alaihi wa Sallam). The only way to get victory is to follow strictly the ways of the Holy Prophet (Sallallahu ‘alaihi wa Sallam). They should therefore be more and more strict on it….. Then try to give final blow to the enemy”. Hadrat ‘Amr (R.A.) read the letter before the Muslims. Umar’s orders were at once carried out and at last Alexandria was conquered after a heavy engagement. According to some Western historians it was conquered in 642 A.D., while some of the Muslim historians say that Alexandria was conquered in 640 A.D. (20 A.H.). After the conquest of this great city, one time a glory for the’ Romans, Hadrat ‘Amr wrote to the Caliph, “I have captured a city from the description of which I shall refrain. Suffice it to say I have seized therein 4000 villas with 4000 baths, 40,000 poll-tax-paying Jews and 400 places of entertainment for royalty”. Philip Hitti writes, “The Caliph entertained his general’s messenger with bread and dates; they all joined in a thanksgiving service in the Prophet’s mosque”. Afterwards Hadrat ‘Amr (R.A.) captured the remaining fortresses in Egypt and it came under the full sway of Islam. Local Christians and Jews were given freedom of religion; various taxes imposed by the Romans were abolished and the general condition of the country improved. The Egyptians had never enjoyed such a period of prosperity and peace before. “From Umar, the servant of Allah and “Amir”(Leader) of the Muslims to the River Nile of Egypt. O Nile! If you flow of your own desire, we do not need you. If you flow by the order of Allah, we pray to Him to keep you flowing”. The letter was thrown into the Nile and it over-flowed that year. In this way Egyptians were stopped from an un-Islamic practice. This had a very good effect. The Egyptians realised the spiritual power of Islam, and entered its folds. The glorious rule of Hadrat Umar (R.A.) came to an end with his death on Wednesday the 27th of Dhil Hijjah, the year 23 A.H. (643 A.C.) when he was 61 years old. There was a Persian slave of Hadrat Mughirah bin Shu’bah, named Abu Lu’ Lu’ Firoze. One day he complained about the burden his master had imposed upon him. The complaint was not genuine, hence Hadrat Umar (R.A.) ignored it. Next day, early in the morning when Hadrat Umar (R.A.) went to Masjid to perform Fajr Salat, the slave who was hiding in a corner, attacked him with a dagger and stabbed him six times. People overpowered the assassin but he slew himself with the same dagger. Before his death the Muslims asked him about his successor, he appointed a panel of six persons, Hadrat ‘Uthma Zubair, Talha, Sa’d bin Waqqas and ‘Abdur Rahman bin ‘Auf (R.A.) to select a “Khalifah” from amongst them within three days after him. He requested Hadrat Aisha (R.A.) for permission for his burial by the side of the Holy Prophet (Sallallahu ‘alaihi wa Sallam). Though she had reserved that place for herself but on Umar’s request she gave it to him where he was buried.